The nearest major airport is in Albuquerque, 125 miles south of the Ranch. There are several car rental agencies located in the airport. We encourage you to help Ghost Ranch minimize vehicle traffic, eliminate parking congestion, and maintain a safe, clear air environment by not driving while you are on the Ranch. If you search for “Ghost Ranch” for directions, it WILL NOT take you to the correct location. Please look at the map at the bottom of the page to see where you’re going. Alternatively, if you search for “1708 Highway 84, Abiquiu, NM,” it will take you a mile or two northwest of the main entrance. If you drive, refer to the maps below for directions. The Ranch is located northwest of Santa Fe, New Mexico, some forty miles north of Espanola on US 84. Watch for the Ghost Ranch sign on the entrance gate between milepost 224 and 225. 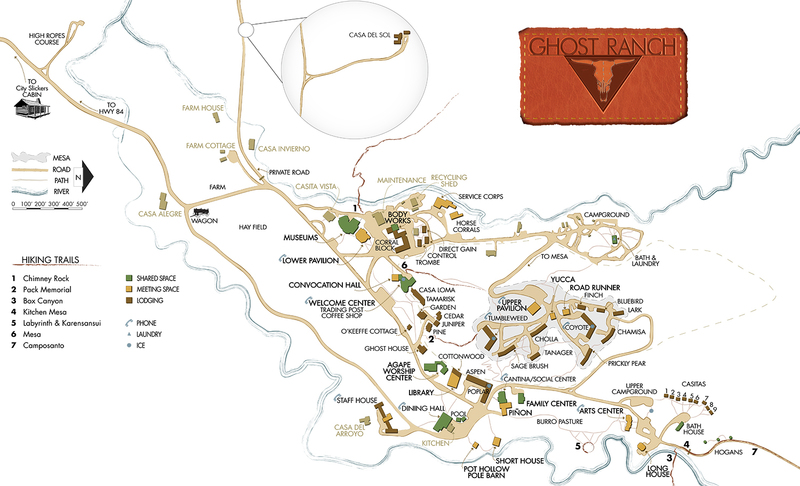 There is also a map of the Ghost Ranch campus at the bottom of the page that might help getting around the campus. You can click on it to make it bigger. Follow the main road until it forks, then take a left. This road will pass the farm on the left. Stay to the right. Continuing on this road, you will encounter anther fork. It will be a triangle of grass with one big tree in it. Take the left fork. The Lower Pavilion (where you check in) will be on your left. The nearest major airport is in Albuquerque, 125 miles south of the Ranch. There are several car rental agencies located in the airport. Ghost Ranch has teamed up with the Santa Fe Sage Inn to provide shuttles to Ghost Ranch on Monday and from Ghost Ranch to Santa Fe on Sunday. For more information, such as how to get to Santa Fe from the airport, look at Ghost Ranch’s directions page here. If you take the train, call (505) 685-4333, ext. 152, for information.